"I told them they will see your book in print and wish they'd gone for this one." Balm for my creative wounds...her kind words. In August, I saw a recipe for a magic pie/literary spell for the muse here and, though I was utterly incapable of forming a sentence at the time and blown-out by the lack of progress--I decided to take a creative leap of faith anyway. Anyone who knows me is currently double-checking the picture posted above and saying, "No way she made that." My disdain for cooking is known far and wide...but then, writers will do just about anything to avoid having to actually work, right? Reading Patry Francis' account of the magic worked by the pie for her muse was incredibly inspiring to me. In it, she relates how last August she was, in her words, "an unpublished waitress" whose manuscript was making the rounds...this August, she baked her Literary Blues pie with an advance review copy of her forthcoming novel at her side. Her friend, a fellow-writer, also has worked this particular brand of magic with success. The pie re-creates one served by none other than Pulitzer-prize winning novelist, Marilynne Robinson, during a dinner Francis was guest for (another great story). So I crafted my very-first-ever homemade pie on an August afternoon, concentrating on things I wanted to accomplish this year with my writing. I expected M. to look at me askance when I offered him a pie (remember, I don't cook)...to say nothing of what he'd think of the "magical" aspect of it. 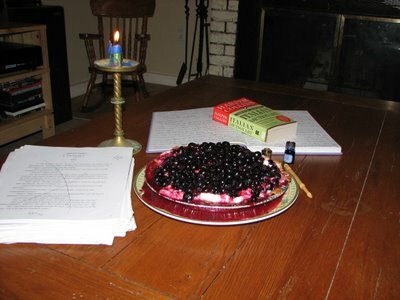 But instead, he was excited and insisted I photograph the pie just right--with talismans of projects-in-process and my pen and ink set present. The kids were completely overjoyed (mom made pie?) and each talked about magic of their own as I set down their slices on the table. We ate with the unseasonably cool late-summer air billowing in the screen door, a candle lit, and blueberry-stained smiles. My muse, slow to respond at first (likely also suspicious of my cooking) has been visiting in fits and starts. I pulled out the contact list and actually started polishing my letters and the manuscript to send off. These sound like small accomplishments, but when you are plagued with self-doubt as I have been--they are nothing short of minor miracles. 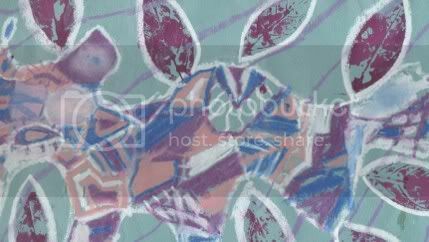 A second "story" has started to take shape in the odd collages I am making for it (creating the background in pictures and images, not words--which is unusual for me as well). My anthology project idea has also started to shift focus a bit for me, veering off into personal archeology. But, the most amazing thing of all is that I am writing again...I am falling back in love with the process...savoring the turn of phrase, the revision, the crafting of words on a page. It is heady--intense--and delicious. You will never convince me that this isn't, indeed, a strange and practical magic. I absolutely believe in magic. It's in the small moments, in awareness, in daily ritual. And, yes, it makes the world shift. You've written (and performed) a wonderful spell. Congratulations. What a gorgeous pie and a terric description of the Literary Blues event! But the best part is that YOU'RE WRITING! I'm going to link you so that I can keep in touch. Thanks for being part of the magic! How totally, totally beautiful! I LOVE the idea of that pie. I do love the idea of such magic. And I beleive in it, because it is the hope and intention baked into it, that makes it powerful. I can't even imagine any editor not thinking they should take your words and run with them! I know your friend-editor is right! Keep pushing. Don't stop. Bake pies over and over, if you need to. You inspire me! What a wonderful post. I am deeply sorry to hear the sad tale of your book but so glad to be part of the recovery. Now the pie seems like a tool of healing as well as a spell-caster. Thanks for joining us in the great literary pie bakeoff. A beautiful pie! and a beautiful leap to faith. All of this pie talk (I’ve also read Patry Francis’s) compels me to relay the story of when I was doing my master’s defense. The external reader asked, “How do you know when a piece [of poetry] is complete.” I used the analogy of making a pie crust...having the ingredients at the right temperature, kneading the dough just right; too much it won’t be light & flaky but will be tough...for best results, you cannot over handle pie dough but you can't under handle it either... I was giving a tutorial on how to make the perfect pie-crust which is only obtained after you’ve bungled a few and have acquired a feel for it. I thought it was a good analogy. When I finished answering the question, the Chair looked puzzled and asked, “Who has time to make pie?” The academics got a laugh and agreed that they had no idea what went into making a pie-crust. oh this is just fantastic. thank you for this story...sharing the magic you have experienced. i can't wait to hear what happens next for you my dear. I just finished reading your piece in Sage Woman #70 - it was so beautifully written I had to check out your blog. You leave me inspired and in the mood to bake! P: Thanks for the inspiration! A: I may just have to keep baking--scary as that is...I won't quit. S: Yes, the pie is a recovery tool as well...I'm looking forward to checking back in next August and watching the progress. L: We used silverware, but barely...thanks for celebrating my next steps with me. S: Yes to the wine, the pie, and the words! I believe! I believe! And I think that I have found this post at just the right time - I am going to collect the ingrdients & my thoughts this week & cast my own spell this weekend!! Thank you & keep writing - I'll follow you for inspiration!! Ooh now this is wonderful. Congrats on the pie-most of all though congrats on finding a path that worked to get your writing flowing again. this reminds me of the chef who put all of his emotions into his cooking and they took hold of everyone who ate his food. i really do believe that these rituals can make a change...they are engraved into life and the universe now and their footsteps can now be seen. good luck with your writing and new beginnings.